Hold active meetings and let participants think with their hands! 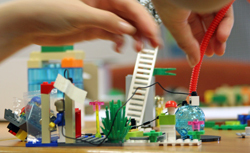 LEGO® SERIOUS PLAY® is a moderated process in which each participant contributes knowledge and experience. Together, they create a shared understanding of challenges and develop solution approaches that are accepted by the whole group. If the constraints of strategy processes are changed, the content generated will also change. LEGO developed LEGO SERIOUS PLAY since 1996 together with a business school. Since LEGO bricks are known and popular in many cultures, participants are quickly able to contribute to the process. As an unusual means of expression, LEGO SERIOUS PLAY stimulates novel ideas and perspectives. Unlike in many business settings, moving beyond cognitive reasoning to social and emotional elements is allowed and encouraged. All participants have an equal share. Ideas remain visible and cannot as easily be ignored. Participants who struggle to assert themselves in verbal discussions will especially benefit from this structure. The fun involved with LEGO bricks can relax participants even when addressing difficult topics. Special sets with materials have been pre-packed for LEGO SERIOUS PLAY workshops. Typically, each participant gets a starter kit so that all participants have the same materials at hand. Many clients decide to buy the materials to continue using them in their daily work. For a single workshop, the materials can also be rented. The LEGO SERIOUS PLAY process starts with skills building. In this phase, participants can become familiar with the materials and the phases of the process. The purpose of the workshop is approached in a sequence of building challenges. In each building challenge, the facilitator formulates an open question. Within the short building time, participants build their responses with LEGO bricks. When the building time is over, each participant shortly explains his or her model to the other participants. After the participants have built one or more individual models, these models can be connected or the group can build a shared model. The process should always be facilitated by an experienced facilitator. Formulating building challenges that make for a successful LEGO SERIOUS PLAY workshop requires a lot of experience. During the workshop, the facilitator helps participants to express themselves using LEGO bricks and ensures that all participants have an equal share in the dialogue. An external neutral facilitator is especially helpful with difficult topics. Book me as a facilitator using the LEGO SERIOUS PLAY methodology! Are you eager to tackle business challenges in a playful way? Talk to me about an individual workshop concept! Disclaimer: LEGO and SERIOUS PLAY are trademarks of the LEGO Group, which does not sponsor, authorize or endorse this website.